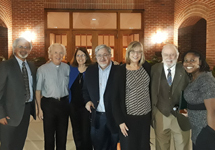 On November 30, events to recognize International Day of Cities for Life / Cities Against the Death Penalty were held at various locations in our Florida dioceses. This annual, worldwide effort has been spearheaded by the lay Catholic community of Sant&apos;Egidio since 2002. Over 2,000 cities across the globe have declared themselves "Cities for Life" and are committed to the abolition of the death penalty and a more civil form of justice. Across Florida, specific activities varied by location and included special Masses, interfaith prayer vigils and a variety of presentations on the death penalty. Speakers included death penalty abolition advocates, family members of murder victims, prison ministers, death row exonerees, FCCB staff, clergy and bishops. Florida, which houses the country&apos;s second largest death row, was one of only five states in 2016 that imposed more than one death sentence and carried out executions. Since the reinstatement of the death penalty in 1976, 95 inmates have been executed in Florida. A total of 27 individuals have been exonerated from our state&apos;s death row. More information on the status of the death penalty in Florida can be found in the Culture of Life Series brochure, A Catholic Response to Florida&apos;s Death Penalty. This brochure is also available in Spanish.